From 2013 runway shows to mainstream brands, this nineties scrunchie trend has been lingering for a while. I was never one for hair accessories, but I'm feeling nostalgic and admittedly started a scrunchie collection. If you fear looking like your on our way to aerobics class, there are ways to modernize this accessory trend. Straight hair in a low ponytail is best with a large scrunchie. Those of us who don short do's, try a low bun (secure with elastic first) and use a small scrunchie, so the little hair you have still shows. If you maintained your long hair throughout the bob/lob phenomeon, then you have more scrunchie options - half up, half down, the traditional high pony in a large scrunchie (so nineties) and a top-knot bun held with a printed scrunchie. This is a trend to try - fun, flirty and everyone loves a throwback! 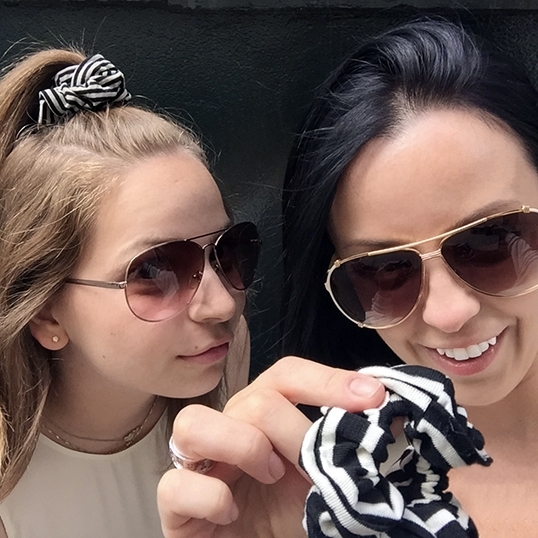 Pictured here: Brandy Melville Printed Scrunchies. Looking for something more subtle? Sephora Collection has a small, faux leather-like scrunchie available in black - perfect for shorter hair styles.